While sweating may seem like an uncomfortable body function, a good sweat can actually provide you with several health benefits — even if you’re not in the gym. Here are a few surprising reasons to get sweaty. Keep in mind, these benefits only apply for mild to moderate sweating; see your doctor if you suffer from extreme perspiration. If you’re feeling down, sweating it out can help cure your doldrums, which means the benefits of your hot yoga sweat session may be more than just purely physical. While we all know that exercise can release endorphins, giving your moods a much-needed boost, but the link between sweat and happiness may go even farther than the gym. 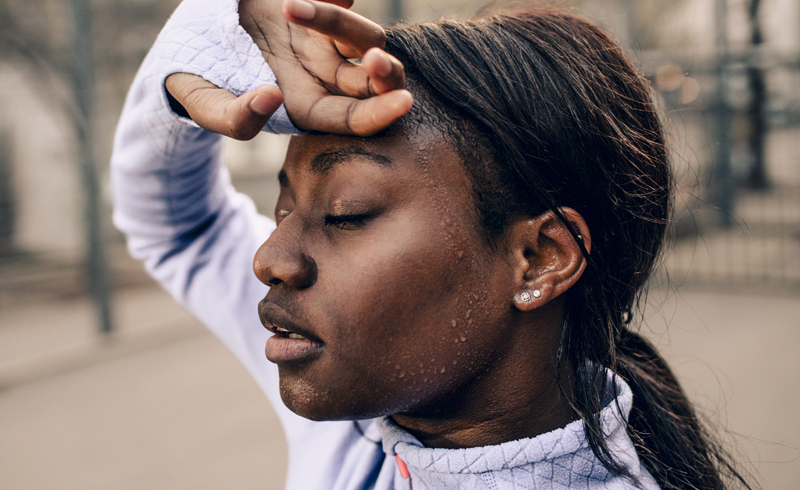 Sweating in general reminds us of heat, sunshine, and yes, those warm, fuzzy feelings that go with that, tricking your brain into a happier mood by association. When you sweat, your pores open and let out toxins. This can, in turn, help you to avoid acne and other skin blemishes. Indeed, moderate sweating may be one of the best things you can do for your skin. Of course, if you sweat excessively, the opposite may be true. People who have hyperhydrosis (the medical term for excessive sweating) may be at a higher risk for skin problems like warts, rashes and eczema. Scientists at the University of Michigan have shown that eccrine sweat glands host an important reservoir of adult stem cells, which play a key role in the healing and closing of wounds, such as scrapes, burns and ulcers. When you sweat, your body has a chance to rid itself of sodium, which can help lower blood pressure. While having too little sodium can cause health problems, most Canadians seem to have the opposite problem, as many of the packaged and takeout foods we eat have added salt. A study performed at the University of Wisconsin found that sweating in a sauna helped with lowering subjects’ blood pressure, concluding that enjoying a sauna for 15 to 30 minutes, three to four times a week, can be beneficial. Did you know that, medically speaking, the skin is a part of the excretory system? Just like the other organs in the excretory system, the skin performs an important role in ridding the body of toxins. One of the many health benefits of sweating is that you’re just helping your body get rid of junk. Small amounts of toxins like lead, arsenic, mercury and cadmium are found in sweat. The more you sweat these toxins out, the less you’ll have in your body. This sort of detoxification process, especially when sustained every day through exercise, can help you to stay healthier and live longer. In today’s culture, we often think of sweat as unattractive, and apparently some germs think the same. Human sweat contains compounds such as dermcidin that can help to fight fungi, bacteria and viruses. Because of this, one of the health benefits of sweating could actually be increased immunity. One other possible benefit of exercising with a cold: If you’re generally well-hydrated, a workout can break up congestion. When you work out in a hot environment, you may be burning more calories than you would otherwise. Working out in a hot room increases your heart rate and makes your body work harder. (If you’ve ever been to a hot yoga class, you’ll agree with this statement). Similarly, according to ACE, exercising in warm weather uses more energy than exercising in a cooler environment. While there can be significant health benefits of sweating, you need to exercise caution. Make sure you stay hydrated, beware if you have high or low blood pressure, and be especially careful if you’re pregnant. Also, exercising in hot environments can sometimes make it easy to lose focus, which could lead to an increased likelihood of injury. Additionally, heat (like the kind experienced in a hot yoga class) can sometimes make it easy to overstretch. Be careful—straining or tearing a muscle could negate some of the benefits of sweating in hot yoga classes. Because sweat causes the body to lose potassium, if you’re sweating a lot you may want to increase your potassium intake. Bananas, potatoes, squash and yogurt are all good sources of potassium.